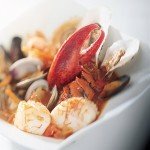 Raymond Oliver, author of Gastronomy of France, said, "The reason that bouillabaisse has a world reputation is because it is an aphrodisiac." 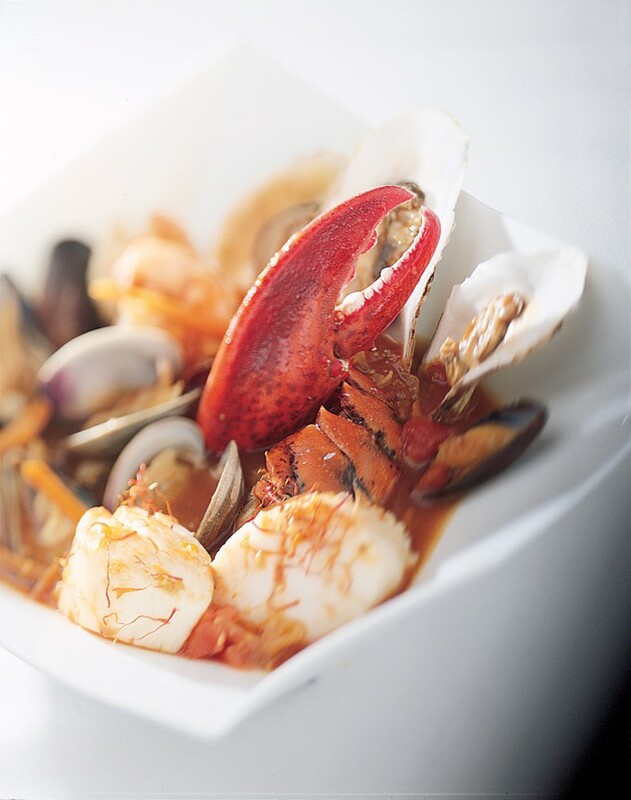 Our seafood Bouillabaisse, my father Francois's version, features shellfish and julienned vegetables. To prepare the broth: Heat the olive oil in a large saucepan or dutch oven. Add the onions, leeks, celery, and carrots and cook covered until tender, about 15 minutes, stirring often. Add the shallots, tomatoes, tomato paste, white wine, fish stock, salt, and bouquet garni. boil for approximately 25 minutes. Add the saffron and simmer 5 more minutes. To prepare the seafood: While the broth is cooking, prepare the seafood. Rinse the clams, oysters, amd scallops in cold water. Peel and devein the shrimp. Cut the fish fillets into 2-3-inch diagonal slices. Clean the mussels individually under cold running water, scraping off any clinging baracles or "beards." Discard any half-opened shells or any unusually heavy ones, indicating internal grit. Using a sharp knife, force the point of the blade through the top of the lobster head between the eyes; then cut down through the center of the head and tail, splitting the lobster in half. Remove and discard the lobster head and the intestinal vein running down the center of the tail. Remove the claws and crack them with the blunt edge of the blade. To prepare the Bouillabaisse: Add the mussels and clams to the boiling broth and simmer 5 minutes. Then add the lobster, shrimp, scallops, and fish. Continue boiling until all the shellfish are open, approximately 5-8 more minutes. Do not overcook. Remove from heat, adjust seasoning (more garlic or saffron according to taste), add Pernod and chopped fennel, and serve immediately in large warm soup plates. Garnish with garlic toasts.